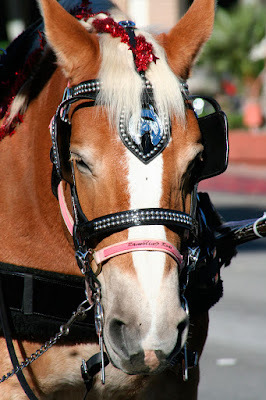 Did you know that you can ride in your own private horse-drawn carriage? Call (951) 237-5438 for more info. 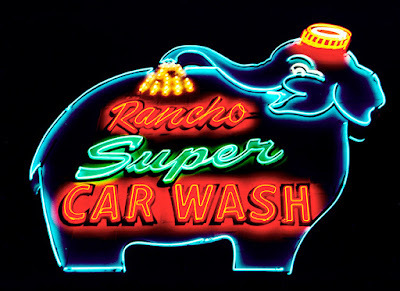 This is the Elephant Car Wash sign, which juts out off of Highway 111 in Rancho Mirage (about 10 miles from Palm Springs). They wanted to remove this sign a couple of times, but the preservationists won out and it's still there. There's also one in Seattle. By the way if you want to buy any of the photos on here, they are available. Just write matthewbam@aol.com, state the photo you are interested in and how big you want it, and I'll get back to you right away with a quote. 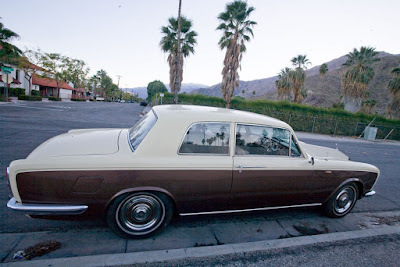 What kind of car is this? The steering wheel is on the right side. I wouldn't want to drive it; that's for sure. 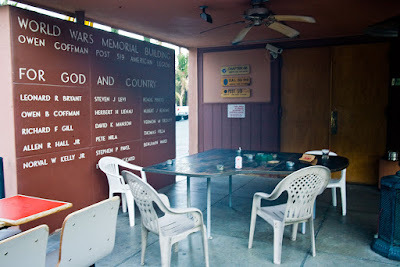 I ride my bike by this American Legion post a couple of times a week. The people inside are really friendly as they always wave and/or say hi (when I initiate it). The following is from the American Legion's main Web site: "The American Legion was chartered by Congress in 1919 as a patriotic, war-time veterans organization, devoted to mutual helpfulness. It is a community-service organization which now numbers nearly 3 million members, men and women, in nearly 15,000 American Legion posts worldwide." Twentynine Palms is referred to as the "City of Murals." 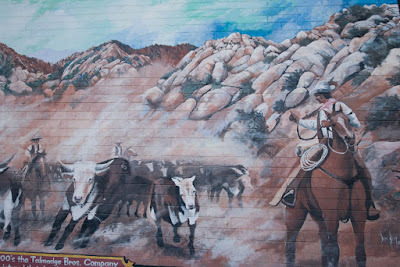 There are murals of the old West everywhere. 29 Palms is is in the Morongo Valley about 60 miles northwest of Palm Springs. Other cities in the Morongo Valley are Joshua Tree and Yucca Valley. 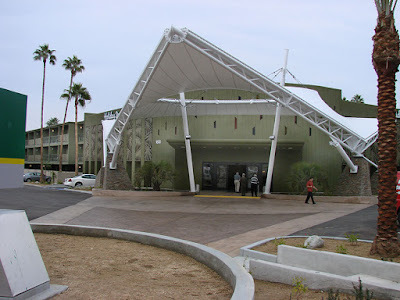 Check out my other post about 29 Palms here. If you walk all the way down Tahquitz toward the mountain downtown, you'll reach one of the best restaurants in town, Le Vallauris. 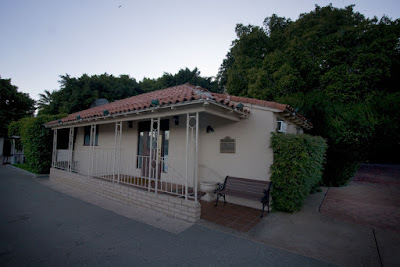 The restaurant itself is located in a home that used to belong to George B. Roberson. He had lived in the home for 50 years. The home (which is now La Vallauris) was built in 1927. Roberson and his mother, Nellie Coffman managed the Desert Inn, one of Palm Springs' first hotels, located across the street where the Palm Springs Art Museum and Fashion Plaza are. When Roberson lived in the house, a Spanish/Mediterranean revival building, it had three bedrooms. A new facade has been added to the original building. There's a new restaurant in downtown Palm Springs. It's Okura, A new Okura Japanese grill and sushi bar joins the existing one that's in La Quinta. It's right next to Starbucks, so after dinner you'll be able to get a good cup of Java. Not a bad idea since Japanese cuisine usually doesn't include after dinner expresso. The fires are lit in the pits in the center of the tables on the outside patio of the restaurant (right next to Starbuck's patio). The Desert Sun reports that the owner is planning to have a variety of classic old movies shown. My guess is that they'll be shown on a large video screen. 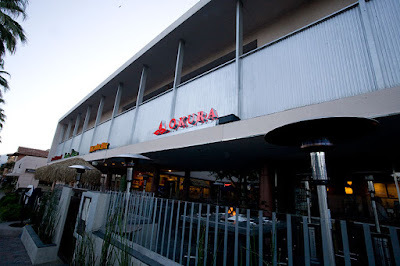 Okura is at 105 S. Palm Canyon, at Palm Canyon and Tahquitz in Palm Springs. 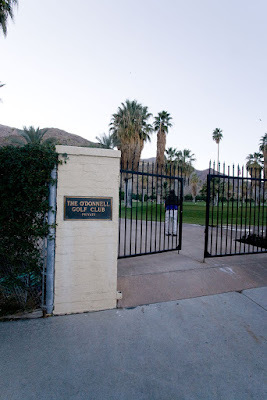 The O'Donnell Club is one block south of Palm Canyon and you'd probably never know it was there if you didn't look hard. I first found out about it yesterday on my daily photo bike ride. Built in the 1920s by Thomas A. O'Donnell, the property includes a golf course. In the 1920s no one, including O'Donnell, knew about the large reservoir that lies under Palm Springs. In order to get water for the property, O'Donnell bought into Whitewater Water Company. He helped the company move water from its source in Whitewater to his property, which was 14 miles away. After the water was collected into a reservoir, O'Donnell used it to put in a nine-hole golf course. 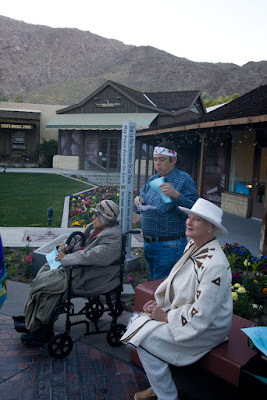 Some of the people who attended last week's Peace Pole ceremony. There were Native American musicians who played instruments for the small crowd. 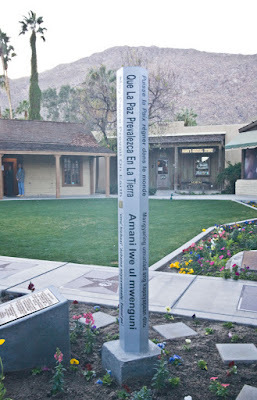 Last week I ran into the ceremony where the peace pole had been added to the Village Green in downtown Palm Springs. It's 6 feet high and messages of peace in different languages is written vertically along the pole. There are over 200,000 peace poles around the the world, including one at Ground Zero in New York City. He check this out. The signs that were obstructing the view of the B of A building on Palm Canyon have been removed. Here's the same picture a couple of weeks ago. The history of this cool edifice, orginally The City National Bank Building is oh so retro. It was built in, 1959 by Victor Gruen Associates and designed by Rudolf Baumfeld. The building contains stucco, steel, wood, and glass and Italian mosaic tile. Many people thought the building was junk from outer space. A curved roofline swoops around the edge of the roof. It cost $400,000 to build. 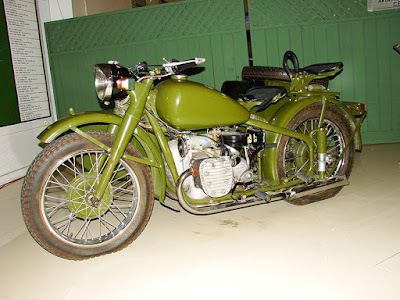 This fabulous green motorcycle's on display at the Palm Springs Air Museum. The museum features airplanes and memorabilia from World War II. The museum is located at 745 North Gene Autry Trail and is open daily from 10 a.m. to 5 p.m.
Just one of those old-fashioned 60s motels, Beckley's Motel. 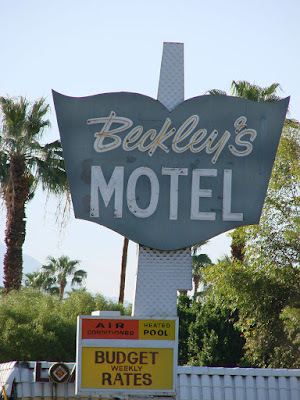 This is one of about three neon signs left in the Coachella Valley. A lot of construction going on here in Palm Springs. 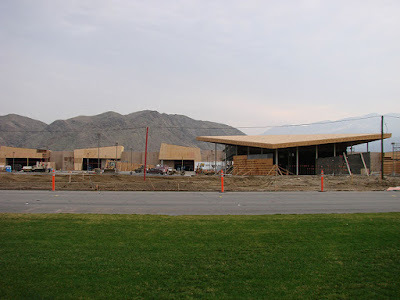 In the picture above is the construction site on East Palm Canyon of what soon will be the new Jensen's Market. I'm hoping it will have hot and cold food bars in kind of a Whole Foods way. Jensen's isn't the only store that's going into site, there are others, I just don't know what they are. Anyone can help, be my guest. On Ramon and Highway 111, there's another shopping center going up that will have Home Depot as its anchor. That store will is right across the street from Lowes. Have you ever noticed when one home improvement store goes up, its competition follows? Andreas Ranch is a 10-acre tribal meeting place. Anthony Andreas owns the property in the southern part of the city. He is a descendent of the Pai-nik-tem or "early morning" clan of Cahuilla Indians. 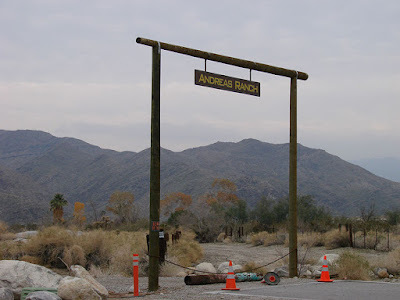 The clan has lived near the Andreas Canyon (the ranch lies at the foot of the canyon) for centuries. The entrance to the Indian Canyons is patrolled by the Indians. The land is owned by the Agua Caliente Band of Cahuilla Indians. You can hike back here and see 150 species of plants, strange rock formations and groves of Washintona palm trees. 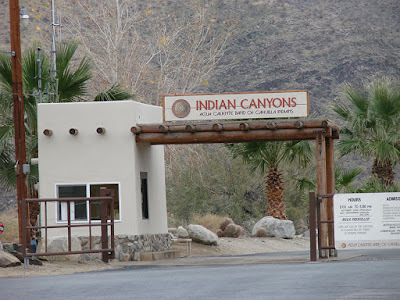 Admission to get into the Indian Canyons is $6 for adults and $3 for seniors (adults 62 and over). Once you get back there you have the option to hike either the Andreas Canyon, Palm Canyon or Murray Canyon. Here are some more photos of the Indian Canyons. 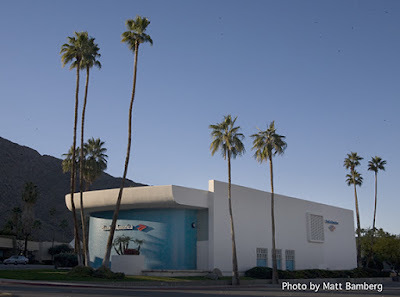 Palm Springs has a new Holiday Inn. It seems as if it took a long time for them to remodel this building (they did a major overhaul of the structure). It's interesting that they put a canvas portico in front of the building. It looks like the ones they put up at the airport. If possible, does anyone know the name of this hotel before it became an upscale Holiday Inn? I know, this is pretty tasteless. I saw this while riding my bike today and thought it would be different for a daily photo blog. Certainly there will be many who disagree. 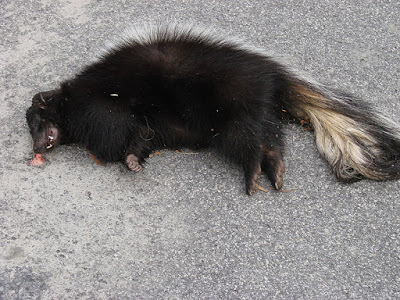 However you feel, the dead skunk is a symbol of many things...and did you know there was a popular song in the 70s about dead skunks? Gee, we've had some weird weather lately. This picture shows the cloud formations yesterday. 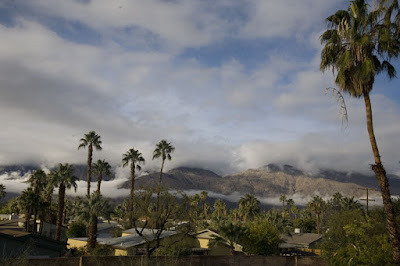 There was spotty ground fog, which I've never seen in Palm Springs before in the 8 years I've lived here. I took this picture from the roof of my house in central Palm Springs. 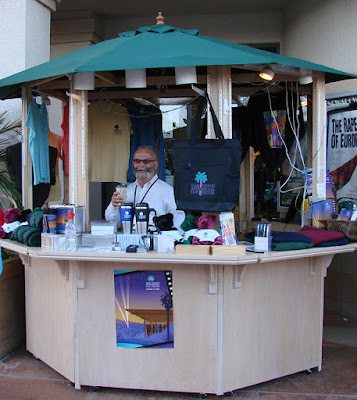 It's back and in full force--the Palm Springs International Film Festival. You can find the movie you want and then buy it online here. This is the 19th year of the festival, one that was started by Sonny Bono when he was mayor. Sean Penn came in through the back door instead of crossing the red carpet at the opening ceremony last Thursday. So did Drew Barrymore. 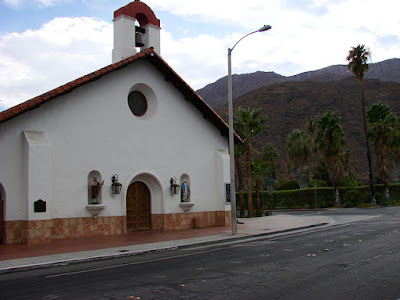 About a dozen posts back I blogged about churches in Palm Springs. This picture belongs is a close up of part of the pictured church that you see on the left. 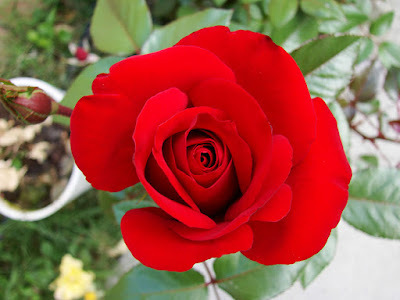 Here's another rose from my garden. 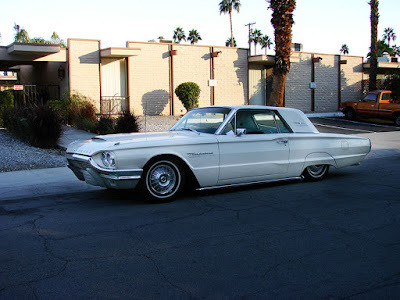 After the Dodge Dart GT, the T-bird is my favorite car. There are many in Palm Springs.